131 different zodiac cycles have been compared. Many of the sources analyzed have been originally pointed out by Darren Worley. Works mentioned by a number of other Voynich researchers have also been included: Stephen Bax, David Jackson, Diane O’Donovan, J.K. Petersen, Rupert Rideec, Thomas Spande (on Nick Pelling’s blog), Ellie Velinska, Rene Zandbergen. 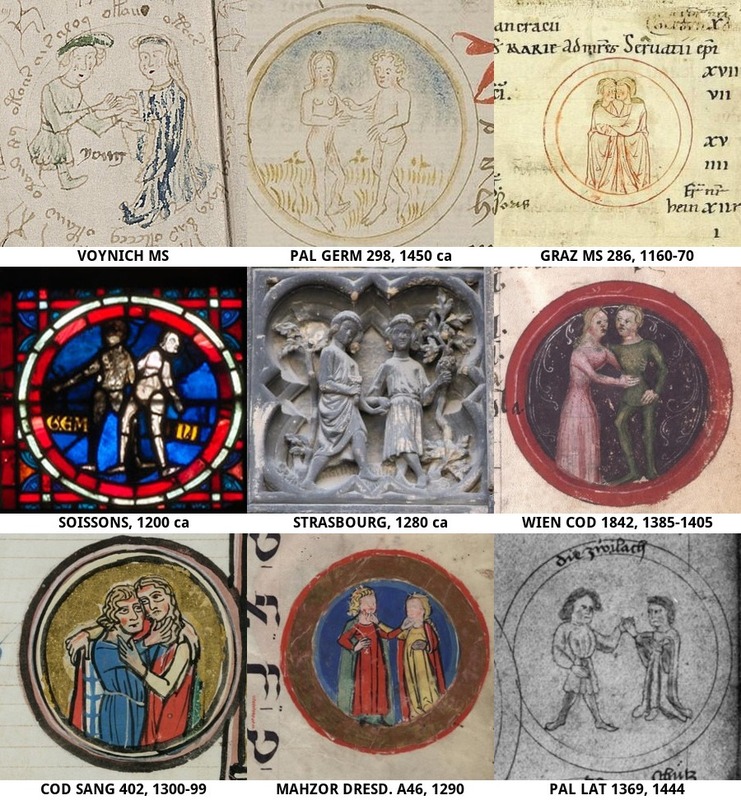 The comparison is based on a largely ad-hoc set of boolean (true/false) features, including some of those originally proposed by Johannes, as well as some of those used on the Warburg Institute Iconographic Database (also mentioned by Johannes). The objects that have been analyzed originate from places corresponding to 26 different modern nations: Afghanistan, Armenia, Austria, Belgium, Egypt, England, France, Georgia, Germany, Greece, India, Iran, Iraq, Ireland, Israel, Italy, Netherlands, Poland, Romania, Spain, Sweden, Switzerland, Tunisia, Turkey, Uzbekistan, Ukraine. The most represented nations are Italy (23 zodiac cycles), Iran (21), France (20), Germany (16, 4 of which Hebraic). Most of the objects are manuscripts, but other media have been compared, including: stone sculptures, stained glasses, metalworks, mosaics, pottery, coins, tapestries. Many of the objects date to the XV (30%), XIII (25%) and XIV (15%) Centuries. The average dating is 1300 ca. Pisces – Cord: Two fish are present and they are joined mouth-to-mouth by a cord. Aries – Bush: A bush or small tree is present. Aries – Grazing: The animal is grazing the plant. Taurus – Manger: The bull is eating from a cylindrical manger (or drinking from a cylindrical well or bucket). This is the only feature for which no matching image has been found. Gemini – Male and Female:* Two persons of opposite sexes. Gemini – Dressed:* The two persons are dressed. Gemini – Embracing: The two persons are represented in an affectionate pose (embracing or holding hands). Cancer – Double: Two crustaceans appear in the image. Cancer – Lobster: The crustacean looks like a lobster, not like a crab. Leo – Tail: The tail of the animal is between its legs. Leo – No Mane: The lion has no or very little mane. Virgo – Not winged:* The person representing Virgo is not winged. Virgo – Standing: The person stands. Virgo – No scythe: The person is not using a scythe. Libra – No person:* Only a pair of scales. Scorpio – Four legs: The represented animal has 4 legs. 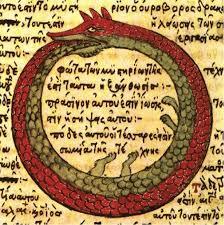 Scorpio – Tail loop: The tail of the animal forms a loop. Sagittarius – Human:* The subject is a person, not a centaur nor a half-centaur or satyr. Sagittarius – Crossbow: The person holds a crossbow (instead of the typical bow). The focus of this writing is limited to the iconography of the medallions, other important aspects of the Voynich zodiac cycle not discussed here include: the fact that the cycle begins with Pisces instead of the usual Aries or Aquarius; the meaning of the about 30 figures surrounding each sign; the fact that Aries and Taurus where apparently split into two separate pages. All the zodiac cycles have been compared simply on the basis of the number of matching binary features. Features that for whatever reason could not be determined have been excluded from the matching percentage. 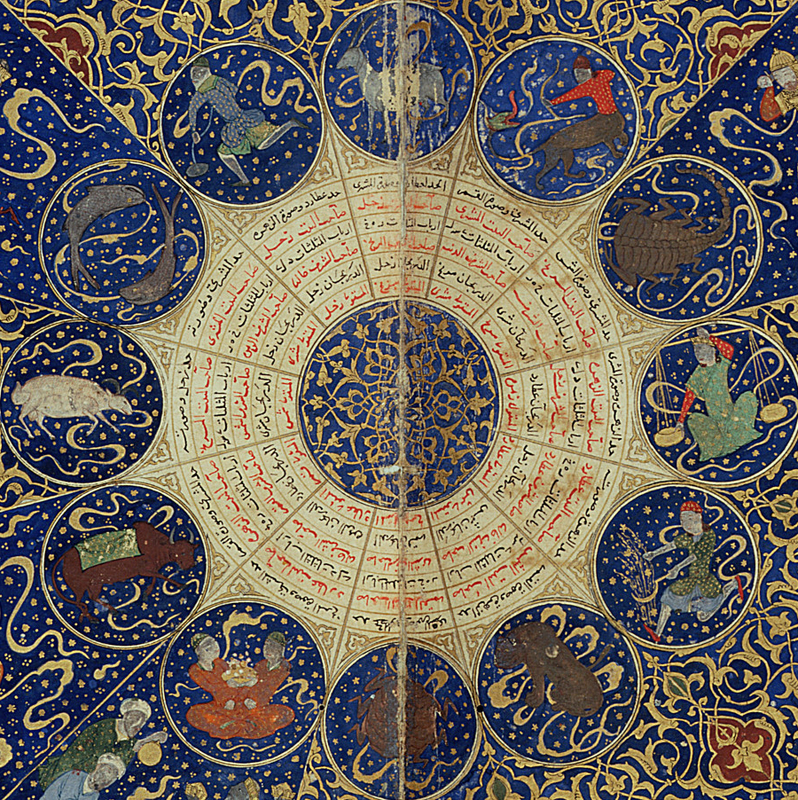 An extensive and well illustrated discussion of Islamic astrological imageries can be found in Following the Stars, by Stefano Carboni, on the the Metropolitan Museum website. A typical feature of Islamic cycles is that a personification of the planetary ruler is included in the image of each sign: so all signs include the image of one or more people. For instance, Aries is usually ridden by a warrior representing Mars. The same warrior appears in Scorpio, holding one or two scorpions. -Sagittarius is the classical centaur. later were probably influenced by European traditions” (Carboni). The Voynich zodiac does not seem to conform to the typical iconography of Islamic zodiacs, but a few characters deviate from the European standard in a direction that could suggest an Eastern / Islamic influence, in particular the goat-like aspect of Aries (image from the Metropolitan Museum, engraved brass basin, Egypt or Syria, 1300 ca) and the figure of Leo (Walters Museum 54523, brass bucket, Iran, XII Century). However important and interesting those details, they can at most suggest a possible Eastern influence: the iconography of most of the signs is European. Since apparently the Voynich manuscript was produced in Central Europe or France but does not seem to be written in a European language, Hebrew works from Germany and nearby areas (a region called “Ashkenaz” in the European Hebraic tradition) provide a relevant parallel. Ashkenazi Mahzorim (prayer books for the High Holidays) often include illustrations of the zodiac cycle. Most of the informations presented in this paragraph derive from this web page by the Israel Museum of Jerusalem and The Mahzor as a Cosmological Calendar: The Zodiac Signs in Medieval Ashkenazi Context by Sarit Shalev-Eyni. 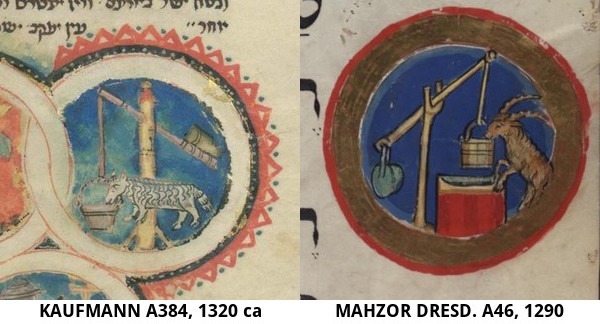 Ashkenazi zodiacs were amply influenced by the European iconographic tradition, so much so that “Torah binders made in honor of boys born in Nisan [correspondig to Aries] sometimes feature a lamb holding a banner. This image is evidently taken from a Christian model in which the Lamb of God holds a flag with a cross” [Israel Museum]. “The set of medallions in the decoration program of the Ashkenazi mahzor was based on Latin calendars in Christian ritual books such as psalters, breviaries, and Books of Hours. 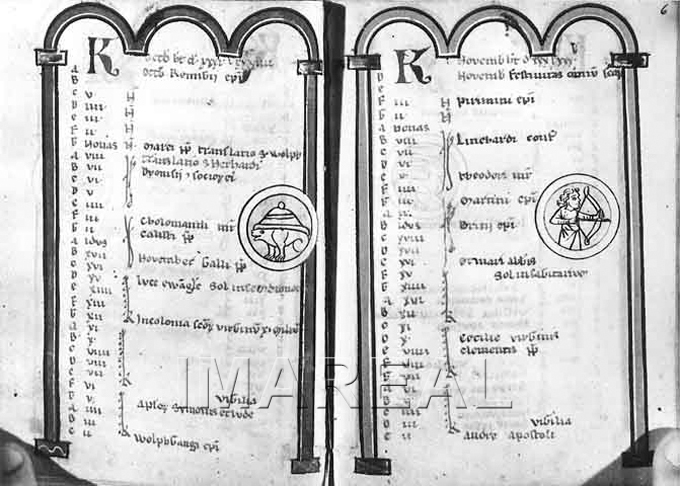 These books usually open with a liturgical calendar containing a list of the Temporale feasts and the Days of the Saints (Sanctorale) in a cycle of twelve units representing the months and accompanied by a double system of medallions containing the zodiac signs and the labors of the months. The illustrators of the Ashkenazi mahzorim adopted the plan of the calendar with the zodiac signs and sometime also included another set of the labors of the months, which further stressed their origin in the Christian books. The affinity to the Christian medallions is also apparent in the iconographic design of some of the zodiac signs, such as the Lamb, the first zodiac sign in the Hebrew cycle, which is designed as a ram with round horns typical of the sign of Aries, or Virgo, that is depicted with a fleur de lis (or another flower), alluding to the Virgin Mary, as was common in Christian calendars” [Sarit Shalev-Eyni]. It seems likely that the author of the Voynich zodiac did something similar: he copied the zodiac sequence from a European manuscript to illustrate a text of non-European content and language. – Pisces illustrations include three or four fish instead of the usual two. – Aries has no horns (it is a lamb, not an adult animal). – Gemini are represented with the heads of animals, to avoid depicting the human form. They sometimes hold a stick (a symbol of the head of the eclipse dragon, commonly found in Islamic zodiacs). In other cases, two men wearing the discriminatory headgear imposed on Jews are portrayed. – Cancer is depicted as a hybrid monster (Sarit Shalev-Eyni: “the phonetic similarity between Satan and Sartan -the Hebrew word for Crab- in this context probably contributed to the association between the two”). – Libra illustrations include the hand of God, emerging from a cloud to grasp the scales. – Sagittarius takes the form of a solitary bow, with neither person nor centaur. Sometimes only the arms and hands of the archer are represented. As can be seen from the above list, Ashkenazi zodiacs often considerably deviate from Christian zodiacs, but mostly in different directions from the anomalies present in the Voynich zodiac. For instance the Oppenheim Mahzor zodiac wheel features a lobster as Scorpio, a monster as Cancer, Sagittarius without an archer. Gemini, Aries and Pisces also differ from typical European illustrations. Sometimes a Mahzor cycle contains only minor variations from the Central European tradition and the illustrations are not easily recognizable as related to a different culture. In these cases, the illustrations are closer to the Voynich cycle: Dresden ms A46a matches half of the binary characters and is one of the best twenty matches. In analogy with the Ashkenazy tradition, the amount of deviation observed in the Voynich zodiac could well be explained as the interaction of two different cultures, one of which is the tradition of Central Europe or France. The present study cannot suggest any specific candidate for the second culture involved in the production of these images. This manuscript from South Germany was found by Darren Worley, following a post by Ellie Velinska discussing a similar manuscript. Cod. Pal. Germ. 298 comprises a number of different texts from different dates, the zodiac signs appear in the fourth section, written in German. The description of the manuscript calls this section “Tierkreiszeichenlehre”, i.e. “an essay about the Zodiac signs”. A Latin breviary written in Seckau, near Graz. The zodiac medallions are drawn in brown and red ink and are not painted. They illustrate the twelve pages of the calendar in the initial pages. It is noteworthy that many of the elements that occur in the Voynich zodiac were already present in Central Europe cycles during the XII Century. This work has been repeatedly mentioned by Diane O’Donovan with reference to Voynich f73v (for instance here). The zodiac stained glass window now in Soissons likely comes from the nearby town of Braine. It was moved to Soissons, reassembled and heavily restored in the XIX Century. The main area is occupied by the large figures of four ancestors of Christ. The figures are surrounded by twenty eight medallions, including the twelve signs of the zodiac. More details can be found in this French document. The right portal of the facade of the Strasbourg Cathedral is flanked by twelve statues illustrating the Parable of the Wise and Foolish Virgins. The bases of the statues are decorated with reliefs depicting the signs of the zodiac and the labors of the months. Strasbourg is the capital of Alsace, a historically German-speaking region. In addition to the best matching sources, some comparisons from other sources that provide interesting parallels for specific signs are proposed. Here those that are more frequently mentioned are listed (more are discussed with reference to specific zodiac signs). This work is discussed in the Crossbow Sagittarius page. The manuscript is a Book of Hours (Horae canonicae in Polonia Scriptae) and the zodiac illustrations appear in the context of a calendar. Since it was impossible to find images for most of the signs, the matching percentage is not as reliable as those of other works. From the description at “e-codices.unifr.ch”: “Book of hours, composed for an unknown convent in the diocese of Basel: excellent example of early Gothic book art. With a Calendar, 14 miniatures of the life of Christ and Mary, the Psalter, Canticles and an All Saints’ Litany”. The manuscript is written in Latin. This 1330 ca English manuscript is discussed by Olga Koseleff Gordon in her paper Two Unusual Calendar Cycles of the Fourteenth Century. In that paper, the Zodiacal cycle is compared with a similar, less anomalous, one (MS M.511, from Bologna, also at the Pierpont Morgan). 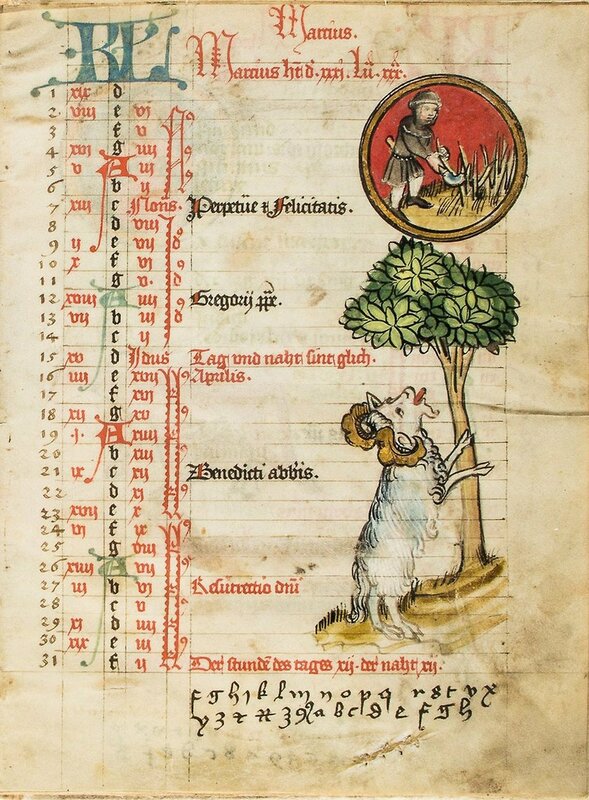 The greatest deviations from standard cycles in ms M.700 are: Aries (two goats instead of a ram); Taurus (entirely missing); Cancer (two crabs); the insertion between Libra and Scorpio of an image representing three goats (Capricorn is also included in the cycle in its usual position and form). The manuscript is written in Latin. This 1444 manuscript has been pointed out in 1996 by Rene Zandbergen as a relevant parallel for the Voynich zodiac. It is also discussed here. Darren Worley writes that it contains a collection of different Arabic astrological texts translated into Latin. The zodiac signs appear in round medallions in seven pages devoted to the domiciles and detriments of the planets. The drawings are sketched in ink outline, lightly colored, with no gilding: the overall visual effect is close to that of the Voynich ms. These stone reliefs appear, together with illustrations of the Labors of the Months, in the third archivolt above the central portal of the church. Their state of conservation in rather poor, yet most of the signs are still recognizable in some detail. This zodiac cycle has been mentioned by user Don of Tallahassee on www.voynich.ninja. From the website description: “Heinrich von Laufenberg (circa 1390–1460) was a cleric from the southwest German town of Freiburg. … His Regimen Sanitatis (Regimen of health) of 1429 is a medical-astronomical compendium of guidance to healthful living that stretches to more than 6,000 lines of metrical German. The work presents the reader with practical rules for healthy living concerning such matters as a balanced diet, phlebotomy (bloodletting, then a common treatment to prevent or cure illness), and ways to prevent the plague. The text reflects the contemporary scientific view that planetary configurations affect an individual’s well-being”. The manuscript is written in German and was produced in Alsace. Zodiac signs appear in two distinct sequences, the first of the two is closer to the Voynich zodiac cycle, but Gemini, Virgo and Libra are missing. This work was pointed out by Darren Worley because of the presence of a Crossbow Sagittarius, so it provides an example of a Crossbow Sagittarius from a region that is now part of France. Another interesting feature of the illustrations is that one or two stars, suggestive of the origin of the zodiac signs as constellations, appear in some of the illustrations; their position is largely consistent with that of similar stars in the Voynic zodiac. The relevance of this work for the Voynic zodiac has been pointed out by Ellie Velinska here. The Liber Albandini is a Latin divination essay. The zodiac signs are depicted in full page illustrations starting with Aries on f37r. The manuscript was written in the XIV Century. The BNF site does not seem to provide any clear information about the place of origin but an unnumbered page at the end of the manuscript contains a long annotation in French in an ancient hand: I assume the manuscript was produced in France. It is anomalous that a zodiac cycle begins with Pisces. Aries is the standard astrological beginning of the zodiac cycle. In the context of a calendar, the first sign is usually Aquarius, corresponding to January. While the position of Pisces in the Voynich Zodiac is difficult to explain, the iconography of the sign is rather conventional, but for “the knot”: the two fish are connected mouth-to-mouth by a cord. In the middle of the cord there is a star, which apparently corresponds to the prominent star Alrisha (“the knot”). The image is at variance with other examples which represent a mouth to mouth cord, but without the knot. In the Voynich image, the cord has been twisted, placing the “knot” at the top of the two fish, likely in order to make room for the large star and its Voynichese label. The “knot” usually appears in illustrations of the Pisces constellation, not of the zodiac sign. In the Pisces constellation, the cord connects the Pisces tail to tail and the two fish do not face in opposite directions, so the Voynich image does not wholly correspond to that tradition either. Possibly, the overall best match among the images presented below is the Soissons stained glass window. Graz ms 286 presents the smiling expression of the fish that was noted by Stolfi and Zandbergen in their EVA transcription of the Voynich manuscript, but the Graz illustration does not include the cord joining the two fish. The Berlin Regimen Sanitatis includes two stars positioned similarly to those in the Voynich ms, but none of the two is connected with the cord. 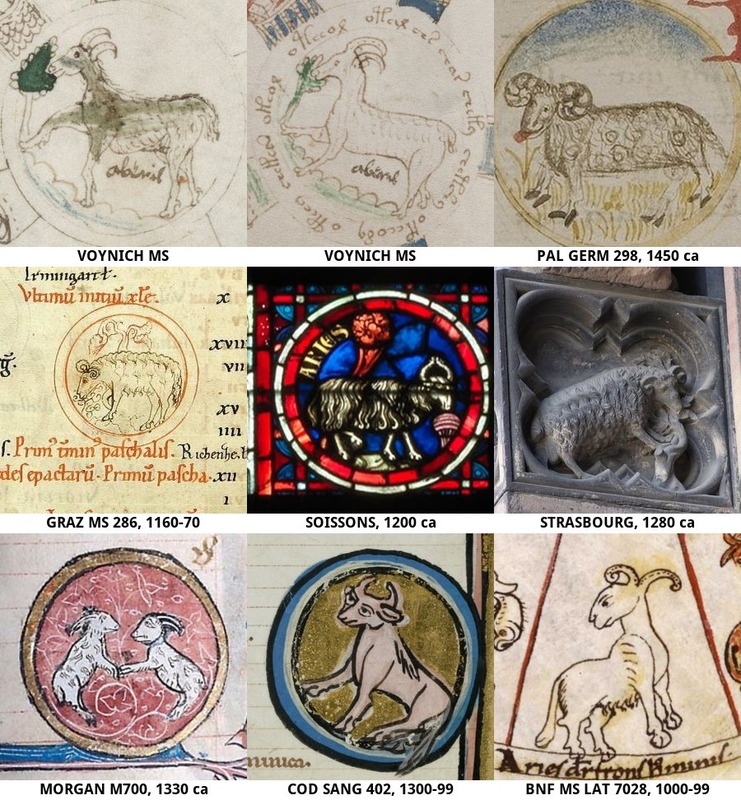 The fact that in the Voynich Zodiac Aries is represented as a goat and not as the usual ram has been widely discussed (see for instance this 2004 post by Jorge Stolfi). I was unable to find any satisfying parallel for the shape of the animal. Possibly, from this point of view, the most interesting one is the highly anomalous ms Morgan M.700. Aries from BnF ms Latin 7028 (Italy, XI Century) is also somehow goat-like and curiously its horns are decorated by a pattern of dots similar to that appearing in the Voynich ms. It has also been noted that the Aries “goat” seems to be grazing. Mary D’Imperio wrote: “An amusing matter for special note is the fact that the animal in each case [Aries and Taurus] is enjoying a meal: Aries is dining with evident relish on the leaves of a small shrub, and Taurus is applying himself with equal determination to the contents of a sort of manger or feedbox carefully and realistically placed at his disposal. These details, in my view, support a horticultural, medical, or agricultural context rather than a magical or mystical one (although this can be only an impression)”. : “The genre scenes, eg. Aries eating a bush, suggest that the signs were redrawn from a calendar”. Aries eating a bush is not uncommon; a possible explanation for this iconography is its derivation from illustrations of the Sacrifice of Isaac and the “ram caught in a thicket by his horns” (Genesis, 22). European zodiac cycles provide several examples of grazing Aries, including some of the best matching sources presented in the following image. This biblical influence could appear also in some Hebraic sources, but I have been unable to find any examples. Usually, in the Hebrew tradition, the zodiac sign is represented as a lamb, without the prominent horns that appear in the European tradition. The bull seems to be eating from a cylindrical manger, or drinking from a cylindrical well or bucket. It has been impossible to find any parallel for this detail. I think this point deserves further investigation. Ewa Sniezynska-Stolot commented: “From the astrological iconography point of view, the Taurus at a well is somewhat strange – unless an image of donkeys was a basis for it and then it would refer to Cancer – but that is certainly going too far” (she seems to be thinking of the Praesepe -the Manger- and Aselli -the donkeys- asterisms). Images of Taurus grazing a bush (similarly to Aries) are the closest analogues I could collect: in zodiac cycles, these images often come coupled for both signs. Another somehow similar image is the Capricorn / Aquarius conflation that appears in Hebraic Mahzorim from Germany. In the Hebraic tradition, Aquarius is often represented as a well and/or a bucket. In this typology, Capricorn is depicted as a goat drinking from the bucket. Stephen recently published a page in which Darren Worley presents various excellent parallels for this image. Please refer to that page for a discussion of this sign. The present quantitative analysis considers three distinct features for Gemini: the two people should be 1) dressed, 2) of different sexes, 3) embracing or holding hands. Of the best matching sources, the only one displaying all these three characters is Wien Cod. 1842 (Horae canonicae in Polonia Scriptae, Poland, 1400 ca). 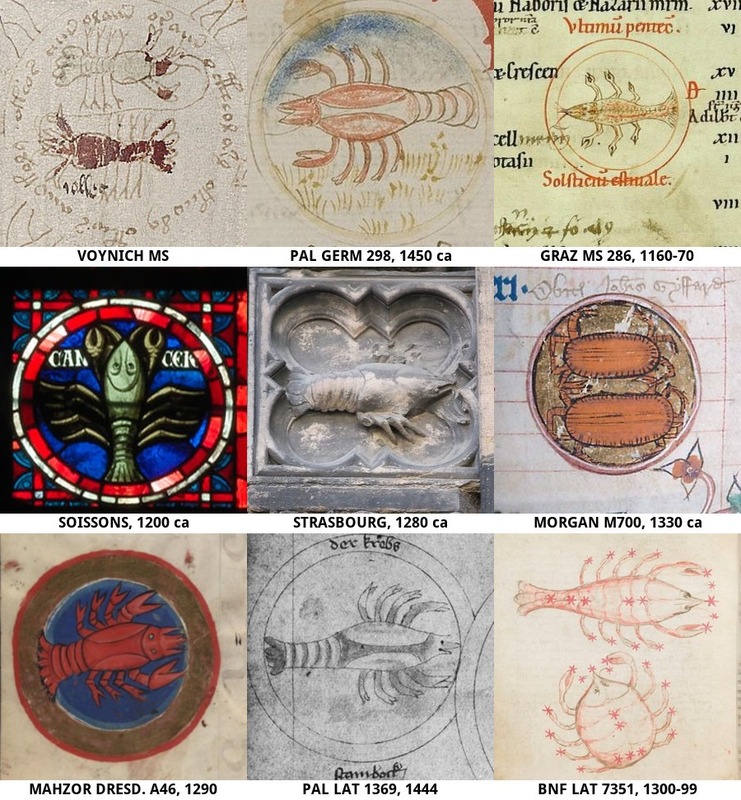 While the classical image of Cancer is a Crab, the variant that represents the sign as a Lobster or Crayfish is common in all Europe: it occurs in about 40% of the examined sources, never in non-European sources. On the other hand, the duplication of the sign of cancer is extremely rare. The better example is the English ms Morgan M.700. Ellie Velinska recently pointed out a manuscript presenting another example (BNF Lat 7352) in which Cancer appears twice, once as a lobster and once as a crab. It is interesting that, in the Voynich manuscript, the two lobsters are joined by a cord identical to that appearing in most illustrations of Pisces. Duplication aside, some of the parallels considered provide good matches for the general shape of the crustaceans (the bifurcation of the lesser limbs, the three “beaks” in front of the head, the two specular semi-elliptical lines on the back). tail that curves around the hind legs”. This iconography is not exclusive to Islamic art and is also frequent in European art. Cod. Sang. 402 (Basel, Switzerland, XIV Century) provides a good parallel for the shape and posture of the animal. The prominent triangular tongue of the lion is an uncommon detail worthy of further investigation (see for instance the above mentioned Persian bucket at the Walters museum). The form in which Virgo is portrayed is very common: a standing woman holding an object (a star or flower, in this case) representing Spica, one of the brightest stars in the zodiac. Most classical sources present the figure as winged. As discussed above, in Islamic images, a person holding a scythe is usually represented. A common variant in medieval Central Europe represents the figure as sitting. Many good parallels for the Voynich image can be found. What varies the most is the kind of object representing Spica (an ear of wheat being the most common). A figure holding an object in each hand is also rather frequent. The woman represented in the illustrations often wears a crown or a garland. I saw no examples in which she wears a chaperone as in the Voynich illustration. The Strasbourg relief and Cod Pal Germ 298 are good parallels, but in the Strasbourg relief the object representing Spica was partly destroyed, and in the German Manuscript the woman holds a garland. In the Graz manuscript, the woman is not holding any object. In the images from Soissons and from the Polish Horae Cod. 1842 the woman is sitting. 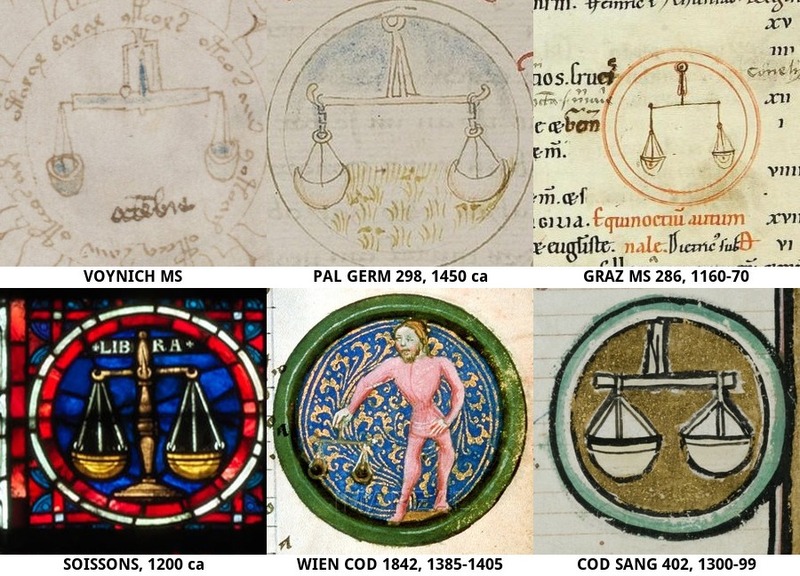 The categories defined on the Warburg database make clear that the most significant variant in images of Libra is the absence or presence of a human figure holding the scales. 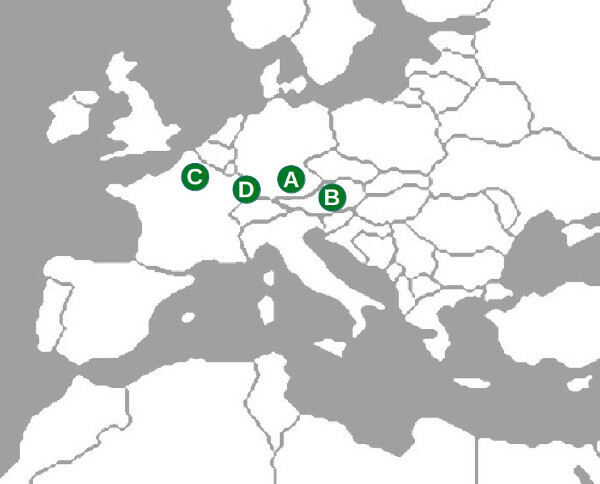 The two variants seem to have coexisted in most regions of Europe. Of the best matching sources, the Polish Horae is the only one in which a person appears. The representation of Scorpio as a reptile or a fantastic animal is typical of Europe, with the exclusion of the Mediterranean regions (the only exception I am aware of is a mosaic in the Norman cathedral of Otranto in Apulia). Ellie Velinska and Darren Worley have recently posted a number of interesting parallels for the Voynich Scorpio (see here and here) including BNF ms Latin 7351, Liber Albandini, France, 1300-1399. User Don of Tallahassee has posted an excellent collection of lizard-like Scorpio images on www.voynich.ninja: the collection includes the Avallon relief, possibly the best match I have seen so far. J.K.Petersen has published a late but interesting French example (Morgan Book of Hours, MS G.1, Loire, France, 1475 ca). 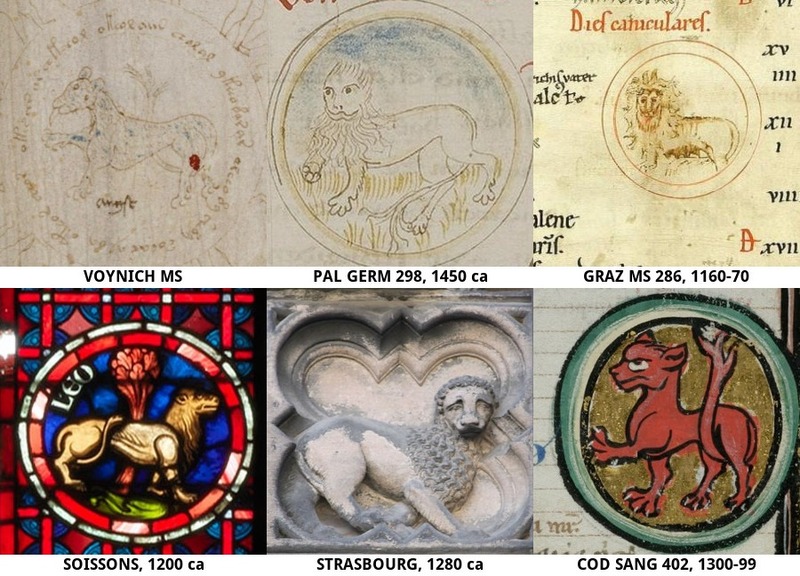 Some of the best matching sources from German speaking areas have similar four-legged animals (in particular Pal Germ 298 and the Graz manuscript) but the French sources seem to display a more consistent tradition in this case, with “lizards” represented in profile. Don has noted that parallels also appear in England (e.g. the Canterbury Cathedral floor roundel, XIII Century). 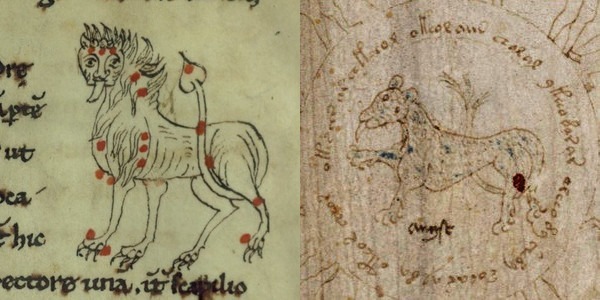 The star that in the Voynich Scorpio is placed above the animal, linked to its mouth by a long “tail”, is the most peculiar feature of the illustration. The Berlin Regimen Sanitatis provides an interesting parallel: a single star in front of the mouth of the animal (see also Pisces above). Sagittarius is usually represented by a centaur. The fully human Sagittarius seems to be absent from late medieval cycles produced in Southern Europe: the exceptions to this are derived from Northern sources (such as Mantova ms Lat.209, De Sphaera, Lombardy, 1470 ca, copied from Children of the Planets woodblocks produced in Basel in 1430 ca). The Crossbow in Sagittarius images has been observed only in works from German-speaking areas. For further discussion of Sagittarius, please refer to this page. J.K.Petersen also discussed some of the images we presented, adding an interesting collection of images of fully human Sagittarii with a normal bow. All the best matching cycles (see list below) originate from Germany, France, Austria, Switzerland and (possibly) Poland, with dates ranging from 1160 to 1450 ca. 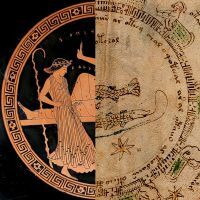 This evidence suggests that the Voynich zodiac cycle was copied from a source that was produced in Central Europe or in France, or by someone who was deeply familiar with works from that area. On the other hand, it is very unlikely that the Voynich zodiac medallions derive from an Italian or Spanish work (in particular, Scorpio and Sagittarius are represented differently in all Southern examples). It seems almost impossible that the Voynich cycle could derive from an Arabic or Persian zodiac. The Voynich zodiac can be seen as anomalous, because it contains a number of uncommon features, but almost all of those features appear in other medieval European works. Some of the anomalies could be explained as traces of an Eastern influence. 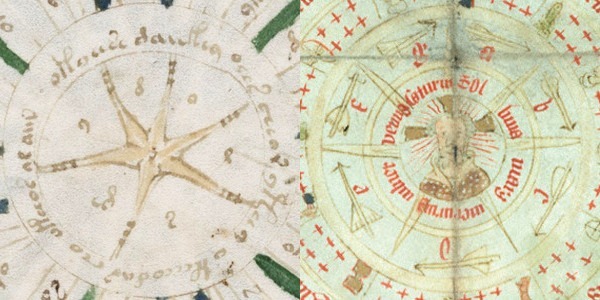 It should also be noted that, even if astrological images usually followed a well established tradition, deviations as wide as those in the Voynic zodiac are known (for instance the above mentioned 1325 ca English ms Morgan M.700, discussed in Two Unusual Calendar Cycles of the Fourteenth Century by Olga Koseleff Gordon). Zodiac signs that can seem extremely deviant at first glance (e.g. the lizard-like Scorpio) actually fit into a well documented European tradition. A recurring element that is typical of the Voynich zodiac and for which it was not possible to find a consistent parallel is the presence of large stars linked by curved lines (“tails” in Stolfi and Zandbergen’s terminology) to the main subject of the medallion. Such stars appear in Pisces, Virgo and Scorpio. Some zodiac cycles (e.g. Bodley Mahzor Opp. 161; Berlin Ms. germ. Fol. 1191 Regimen Sanitatis; British Library ms Harley 7182) include one or two stars for each sign, possibly with the intention of marking the figures as having an astronomical/astrological meaning, but none of the examined sources presents stars with “tails”. * There must be other zodiac cycles that could provide better matches than those presented here. Possibly, a 100% match does not exist, but 80 or 90% matches could likely be found somewhere. * The stars with tails are the most prominent and systematic deviation of the Voynich zodiac from all the inspected cycles. Sources with similar stars would be particularly valuable. * Parallels for the cylindrical well or manger next to the bull in Taurus would be of the greatest interest. It could also be useful to find examples for other details (e.g. the tongue of the lion) and zodiac cycles matching the costumes of the human figures: Gemini, Virgo and Sagittarius. * Further research on English sources could provide better matches for that region. It is a geographic area that has not been investigated in depth. * If the “grazing Aries” actually originates from the biblical story of the Binding of Isaac, it should be possible to find examples of this iconography also in Jewish works. * It would be interesting to examine the complete zodiac cycle from ms Oesterreichische Nationalbibliothek, Wien, cod. 1842 “Horae canonicae in Polonia Scriptae” (I have been able to find images for only five of the signs). Below is the complete list of the analyzed sources, with the corresponding percentage match with the Voynic zodiac. Links to on-line digital images and a few additional notes are provided in this Google spreadsheet. I do not remember who collects zodiac signs of scorpions, but I found another funny one here. Here I have a few scorpions for your collection. Sorry, I do not know why the link does not work. Here again the book link. 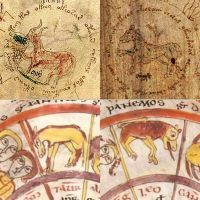 Why do Voynicheroes think the Zodiac-like series in the manuscript is closely based on any one or several Zodiacs in other sources? Almost everything else about the manuscript is disguised (the text), strange (the other images) or not understood (the lack of punctuation, among other things), mostly all three. Why should the Zodiacal images and accompanying text words be any different? Why couldn’t the artist have amalgamated images/text words from several places into a single image with text in each case in the VMS? 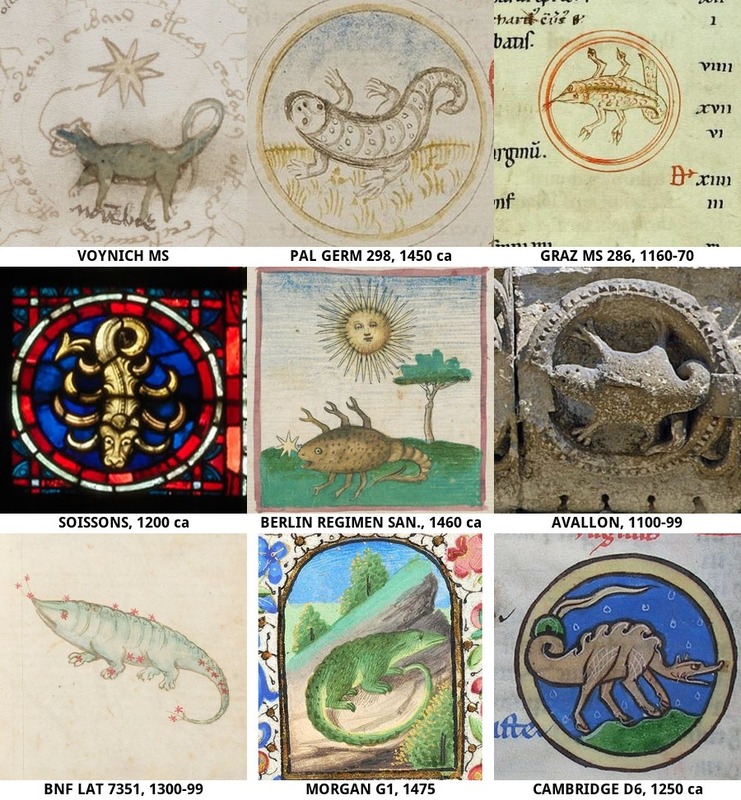 So far, it looks like the best and closest comparisons for the VMS Zodiac images each (say, for the closest five in style and content for each sign) come from different manuscripts or artwork, and often, different regions of Europe and beyond (such as the four-footed Scorpio, mostly found in French and English sources). 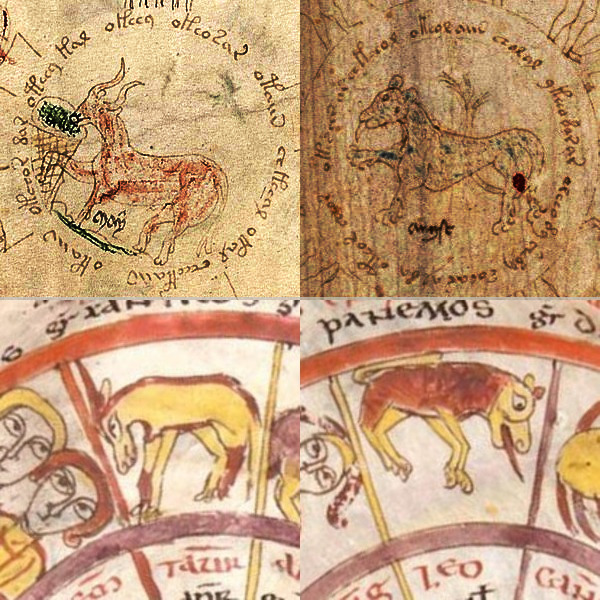 No other manuscript Zodiac or artwork of the time seems to show many signs with the same characteristics as the VMS images. Is it possible there is such a document or group of documents (or other art), yet undiscovered, that everyone is placing their hopes on? 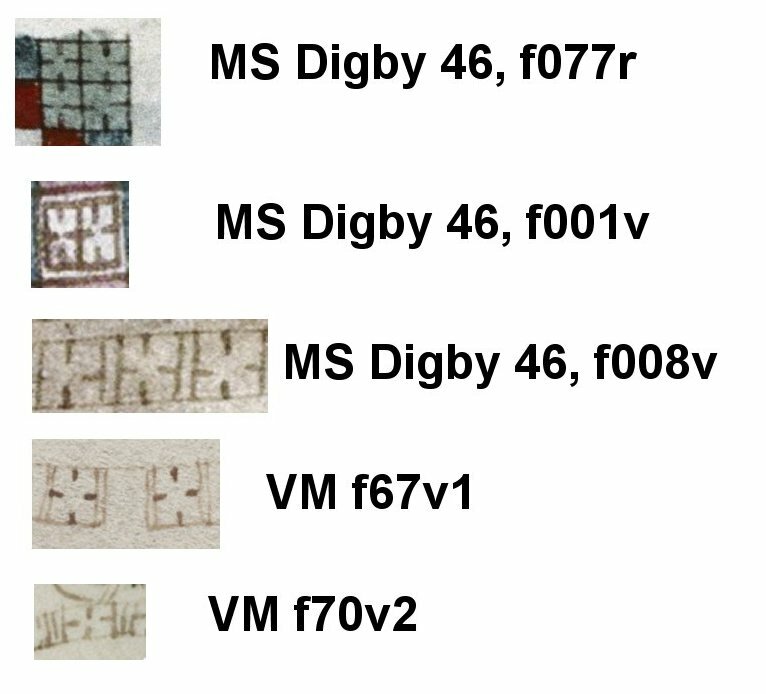 Has anyone seen any of the predecessors to such a document or documents or artwork, in which maybe seven or eight of the signs closely resemble those in the VMS? This leads me to believe the author/artist was being as sneaky about the Zodiacal images as everything else. I’ve been looking through the VMS but can’t seem to find anywhere where it says the Zodiacal images are indicative of some specific place or places, that it contains copies of images from somewhere/manywheres or even that it is a Zodiac. Maybe the Zodiac-like pages are there to help fool the uninitiated, as are many other things. Am I the only one who thinks the author/artist was trying to hide everything and not leave anything out in the open to help those not in on the secrets to discover those secrets? Besides, even if it is a Zodiac, as some seem intent on somehow proving, how does that help solve the rest of the VMS? Unless someone can read the text, it is all supposition, unprovable and fairly meaningless unless exact duplicates are found (and even then, still fairly meaningless). Or will the identification of a crossbow bearer’s origins and/or the duplication of a lion’s tail in another manuscript somehow open the floodgates to understanding? Oxford MHS Astrolabe 37148 (Cairo? 1227/8) was mentioned in 2014 in a discussion about Taurus and the Mansions of the Moon. The astrolabe also includes interesting examples of Aries as a goat. My posts appear to have been awaiting moderation for a few days now. In the hope that they will eventually appear here, I’ll add a few more items which may be of interest for the Voynich zodiac iconography, based on my recent browsing of some Bodleian library manuscripts. That’s ok, nice to see they made it through eventually! As I was browsing the resources on the Morgan Library website, I found another zodiac which may also be of interest in an English book of hours c.1325-1330, MS 700, where several signs are depicted as double: two fish for Pisces, two goats for Aries, two crabs for Cancer. The unidentified star-sign for September again features goats, this time, three of them! This could be Taurus as several signs are misplaced: Gemini occurs in April, (clothed, conjoined twins emerging from behind a shield). Cancer is in May, etc. Virgo holds a fleur de lys. Sagittarius is a centaur. Since you mentioned you would like more examples from England, here’s an almanach (1433) with a zodiac that includes a human archer dressed in similar clothing (but no hat). Unfortunately the zoom is not great. That’s about the only resemblance I see, aside from the Pisces. I love that Scorpio here is not just a reptile, but a winged dragon! Morgan MS M.941 certainly is an interesting document. I also think the central star-with-letters can be compared with the center of Voynich f69r. Hi Marco – your remarks about the similarities between the Almanac and the Voynich f69r diagrams are interesting. One obvious difference between the two is that the Almanac diagram depicts the 7 classical “planets”, whereas the VM series only has 6 divisions. What do you think the 6 symbols might signify in the VM f69r image? Do you think the central star might represent the sun, and the 6 remaining symbols represent the other 6 classical planets? One idea is that each division might represent a bimester (2-month period) of a year. Perhaps marking out time in an agrarian calendar? What else do you think it might mean? It would be good to find other similar examples showing 6 divisions, as this feature seems unusual. it is noteworthy that there are several Voynich “cosmological” diagrams that feature a large central star similar to the one in the Morgan ms pointed out by VViews. Yet, all the instances in the Voynich ms are either six or eight-pointed. If they are related with the seven planets, this is difficult to explain. What you suggest is certainly a possibility: the central star is the Sun and the six divisions are the other planets. Here I tried to connect the names of the planets with the labels in f67r2, but of course I am not convinced that this is at all meaningful. Why does the star have eight points (and likely eight labels)? The star at the center of f69r is marked with letters: this is something the diagram has in common with that in Morgan M.941. But it is also interesting that the letters might spell the word EVA:dolsedy, which is very close to EVA:dolchedy, star #29 in f68r1. As you noted here, that could be related with Taschter / Tishtrya / Sirius. This could suggest that the large stars in the Voynich ms are related to prominent fixed stars and not to the planets. As you write, other examples of 6 (or eight) divisions might help us understand more of this subject. 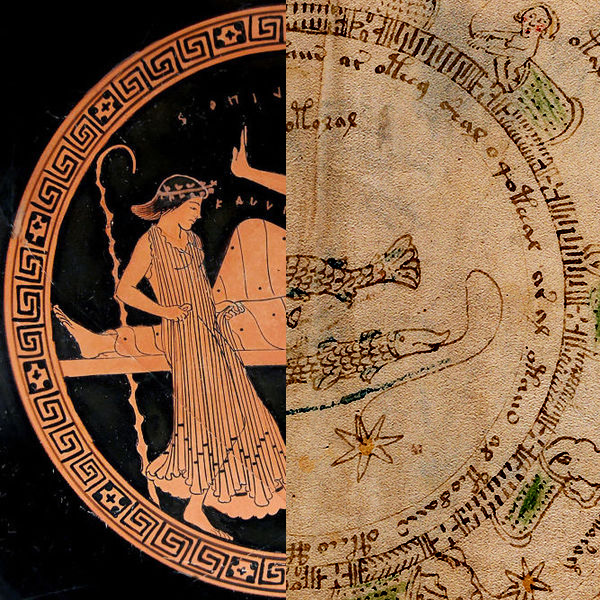 User Sam G has proposed on the voynich.ninja forum a parallel between the geometrical frame of the Pisces medallion and frames in ancient Greek pottery (I attach his visual comparison). It would be interesting to find other examples closer in time and style to the Voynich ms.
Marco – not that it is likely to make any difference, but I’ve already done that. When you talk about finding examples ‘closer in time’ to when Beinecke MS 408 was made, it sounds a little if you assume there will be similar imagery made in fifteenth century Europe, and I’m not sure why you should think that. 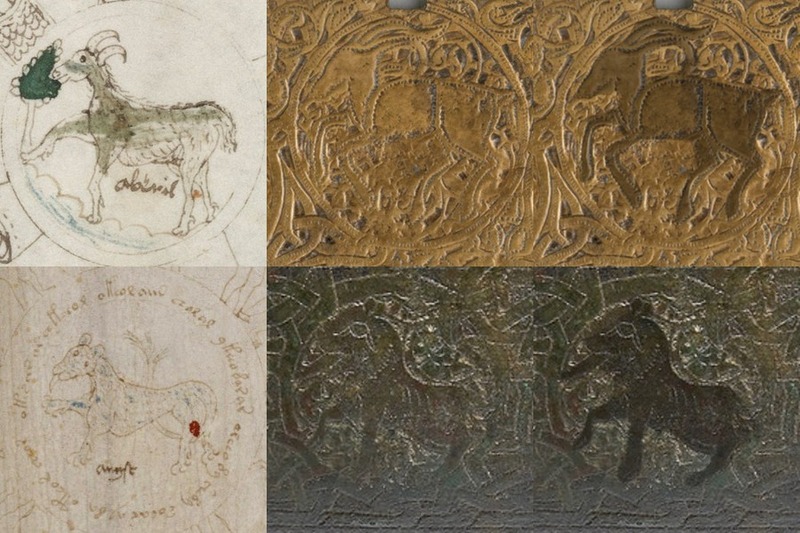 Surely if the aim is to find the time and place where the imagery originated, then the hunt should be for similar practices, and then learn from those something more about the sources used to make the 15thC version. As for tracking motifs which appear in the manuscript, that’s what I’ve done for the past eight years, and the historical picture which emerges is proving reasonably consistent, across the various sections now combined in our copy. The point about that border, by the way, is that it doesn’t use a single pattern. That’s the critical factor just in case you’d like to try duplicating my first results. No harm in doing that. Hi Marco – good post – you always ask the most thought provoking questions! I’ve also been looking-out for similar geometric patterns in medieval manuscripts, but examples similar to the VM appear to be very unusual. However, I don’t think the Greek pottery example has a particularly strong resemblance to the Voynich. It’s curious that within the zodiac pages this patterning only appears on the Pisces page, f70v2 (the other examples are quite close by). The similar examples I’ve found appear multiple times in a 14th-century English manuscript called “Liber fortunae, also known as Experimentarius” by Bernardus Silvestris (AKA Bernard Silvestris or Bernard Silvester), a medieval Platonist philosopher and poet of the 12th century. The manuscript has the reference MS. Digby 46, and dates from the 3rd Quarter of the 14th century, just a couple of decades older than the VM. Its part of the Bodleian manuscript collection. I think the astrological diagrams in this manuscript look quite similar to those in the VM. It would be good to find a digitized copy of the entire manuscript for a fuller-comparison. Finally, I think the bottle-type objects on fol. 043v also shares similarities with the curious “containers” on f88r and elsewhere in the VM. It would be good to know the meaning of these pages in the Experimentarius manuscript. Thank you very much for your observations, Darren! 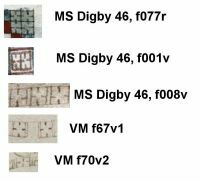 I agree that the “cross-hairs” pattern is important and that Digby 46 is a very relevant parallel. Years ago Ellie Velinska wrote about this subject. One of the manuscripts she mentions (BL Kings ms 5, from the Netherlands, 1400 ca) has frames similar to those in Digby 46. I attach a few circular frames I found interesting for various reasons (from Oxford St.John’s College 17 1110, England; Copenhagen NKS 218.4 1150ca, France; Berlin Germ.Fol.244 1455, Germany), but no “cross-hairs” here. A manuscript from the Benedictine monastery of St. Emmeram in Regensburg (Bavaria) –BSB Clm 14456, 9th century- contains a wonderful zodiac wheel. In my opinion, Taurus and Leo are particularly interesting when compared with the Voynich manuscript. I’ve found several ususual or unique zodiacal features in a Medical Almanac (iatromathematic treatise) from Alsace dated to 1445. This first post presents the first, it is a depiction of Leo with a protruding tongue. I believe this is the first-ever reported example, outside of the VM. The VM example can be seen f72v3. This manuscript, Mckell Medical Almanack, was recently auctioned (2015) – and a very thorough description can be read here. Provenance: (1) Commissioned c.1445 by a patron in the diocese of Strasbourg (the Calendar leaves having the local saints, Erhard, Gangolf, Udalric and Lendelinus amongst others), from the workshop of the artist Dietbold Lauber in Alsace. 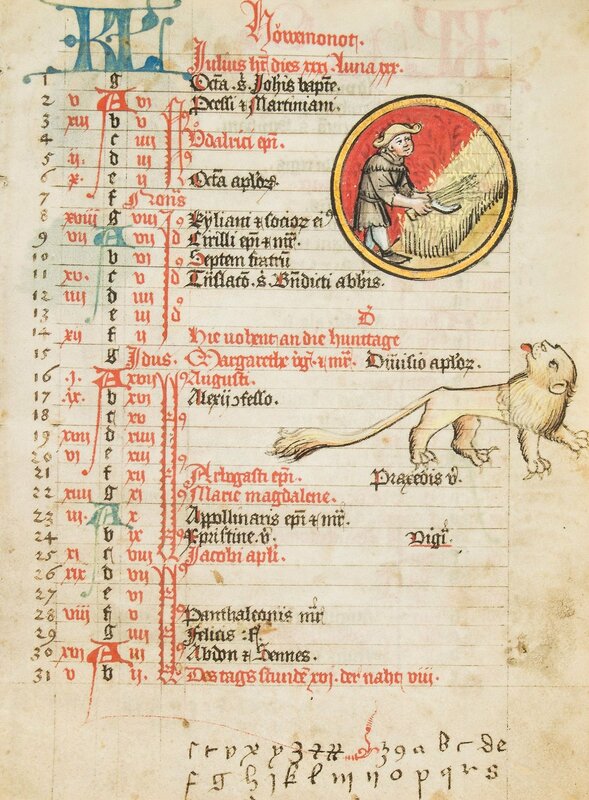 Text and Illumination: Variants of the text here enjoyed great popularity in Germany in the fifteenth century both as part of larger works, or as a work in itself (as here) similar to the later so-called shepherd’s calendars. In some manuscripts it is followed by short treatises on the planets, human temperaments and other medical matters, but as Schilling observed in 1958 the individual layout here suggests that this text always stood alone. It opens with predictions on what will happen in the year depending on which day of the week the first day of January falls on (if Monday the weather will be extreme and there will be little honey and much manslaughter ; if a Thursday the weather will be fine, but there will be little wine ; if a Friday many will have sore eyes ), and includes entries for January advising against bleeding but advising for drinking strong wine with ginger, for February advising bleeding only through the thumb and to eat hot food and drink also warm wine , for March advising to eat roast meat and often bathe, this is healthy and to be bled and cupped often, with further months receiving instructions to consume certain medicinal herbs, eat no meat from the feet of animals, abstain from all smoked meats, not go often to women , as well as offer predictions about thunder, weather changes or meteorites bringing war and death in their wake. It was clearly a prestigious commission for a wealthy patron. The VM examples can be seen at f70v1 and f70v1. One additional unusual “zodiac” feature, with a parallel in the VM, is found in the depiction of the lobster (for Cancer), with its 3 beak-like projections (rostrum) on its head. This manuscript, Mckell Medical Almanack, was recently auctioned (2015) – and a very thorough description can be read here together with additional images. Lastly, both these images contain alphabets, but there are some additional unexpected symbols. Does anyone know what they are? The manuscript is in German (possibly in an Alsatian dialect). Are these additional letters from the medieval Alsatian German alphabet? I always enjoy reading your train of thought. The motif of the lion with protruding tongue has a long history. Before it turns up in Latin European imagery [in woodcarvings, misericords, then heraldry, horse-brasses and, yes, the occasional manuscript though that wasn’t the environment where it first flourished], it had been a Persian (Achaemenid) royal/divine emblem, and then turns up with a less leonine and more cheetah-leopard looking cat in Syria – and thence elsewhere occasionally. It turns up in the very eastern limit of the old Hellenistic empire. The coin for Alexandria was made in the time of Trajan. Those cats have the correct blood-thirsty tongue and one has the uplifted (often shredded) paw characteristic in the Achaemenid imagery. The Greeks and Romans didn’t often draw big cats with their tongues extended, because it did mean ‘blood-thirsty’ back then. In the later, medieval Latin imagery, though, the extended tongue is taken – especially in heraldry – to indicate the lion’s voice, not so much a blood-lust. This was one among many items in the imagery of Beinecke MS 408 which led me to conclude after conducting the analyses for about 18 months, that the original basis for the imagery in the calendar section dates to the late Achaemenid-early Hellenistic decades, and the rest to the Hellenistic period (sensu strictissimo). That such traces of origin should have survived the centuries, and then the attention of scribes in fifteenth century Europe (my view came to be probable i manufacture c.1427-8 in Padua or the Veneto) is absolutely remarkable and argues relatively recent arrival in the Latin sphere. In coming to a fifteenth century Italian provenance, I was preceded by Nick Pelling and Edith Sherwood – I rely on Nick Pelling’s blog for information about such precedents. Sherwood posited 15thC Italian because she believed Leonardo drew the pictures; Pelling because he believed an Italian architect did. Both these writers gave their views before I arrived in 2010. I think Pelling’s may have been the earlier, but gladly accept correction if necessary. In another post, very widely read for some reason, I dated the present form of the animal *with* its red splash to about the tenth century, pointing out another instance of such apotropaic use in a manuscript of the Ottonian period. That post is “fol 72r-i Cross-eyed feline and red splash”, posted at Voynichimagery.wordpress.com, October 29, 2012. I think most of the old-timers here will certainly have read that one. I’ve written up more of the research into that figure and the other calendar centres, noting which (such as the archer) show signs of intentional ‘translation’ into Latin mores, and which do not. I could add a full list of the “folio 72” posts, but this (I’m certain) is quite enough. Hello Darren, here is another example of Leo with a protruding tongue similar to that in the Voynich manuscript. From ms Walters 734 Hyginus, Astronomica, France, 12th century (f10v). Marco – that’s a really great find. Thanks for posting it. I think this is the best example found so far – not only does it have the protruding tongue, it also depicts the curled-tail and exposed claws that are very Voynich-like. Well done! In my opinion, until now the most similar examples of the leopard-like Voynich Leo, have been found in Arabic manuscripts, and yet this is from an early-French manuscript. As a 12th-century example, its a bit older than the manuscripts I’ve generally been looking at – however, some recent research suggested to me that we might find good matches from earlier manuscripts. I didn’t expect to find possible evidence so soon. I’ve been reading a little more about the Bernardus Silvestris’ Experimentarius manuscript that I recently reported (in connection with the “cross-hair” pattern and its Voynich-like diagrams). Although the manuscript [MS Digby 46, Bodleian]; a lot book, containing fortune-telling tracts, dates from c.1375 the Experimentarius originates from the 12th-century, more than two centuries earlier. This made me think older manuscripts might well contain good matches too. This paper “THE SORTES REGIS AMALRICI: An Arabic Divinatory Work in the Latin Kingdom of Jerusalem?” by Charles Burnett mentions that MS.Digby 46 contains excerpts from “Sortes regis Amalrici” which the author suggests might have been transmitted to Europe from the Crusader States (rather than from Spain or Southern Italy). It would be interesting to learn more about the manuscripts transmitted from Frankish Syria to see if they have contain other interesting and relevant parallels. You might also find it useful to look at Spanish works, and more generally at southern Jewish ones. There the habit of drawing animals with curled tails is not only common, but in many manuscripts and wood-carved chests etc., the norm. When I looked into this image and its history, I recall finding some examples in earlier southern Italy and also in Sicily. The crucial points to consider in the Voynich feline figure, I’d suggest are (a) the animal’s having no mane; (b) the rounded ears; (b) depiction with a spotted hide, not the Carolingian sort of shaggy one; (c) the uplifted paw; (d) the way in which the tuft of the tail is represented as similar to the palm-tree. These are details as important to explain, imo, as the tongue or curled tail. 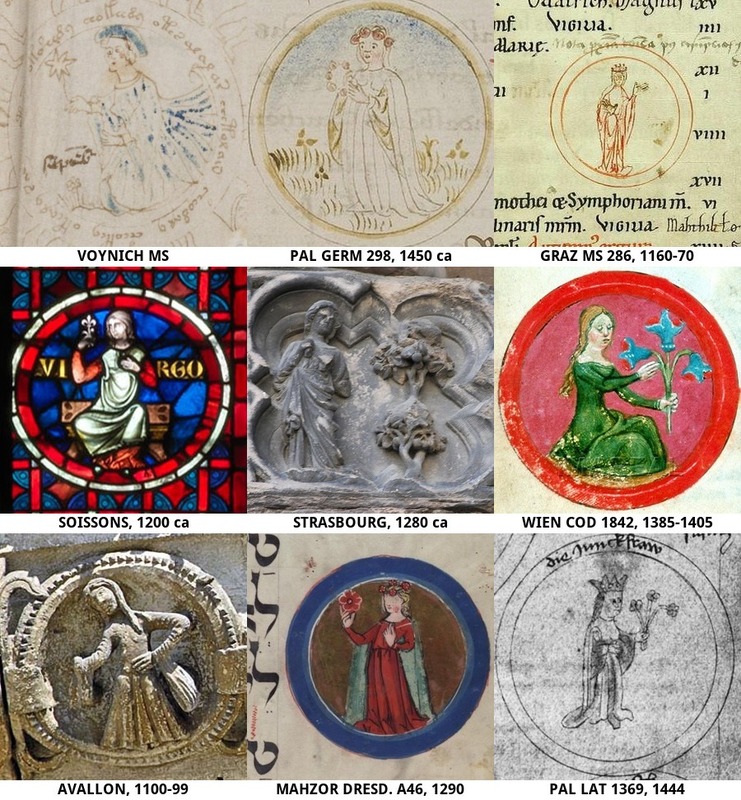 I would agree that a number of the images now occupying the centres of the month-roundels gained their form from precedents of about the tenth century, and there are a number of close similarities between some emblems and imagery found in works made about that time for Fleury. That also connects rather well with the first appearance in the west (as far as we know) for the ‘Standing human archer’ as emblem for Sagittarius, and again with the later evidence of orthography similar to that used for the month-names in instruments made in Picardy, and also the first written records of a crossbowman being referred to as a “Sagittaro” – a term which may have had particular reference to a type of ship (of Dalmatian antecedents) know as a sagitta or something similar. One of the chief uses for the crossbowmen were as ship’s defence. There’s more to it, of course, but it does seem to me that these things in fairly close proximity do suggest that earlier Fleury and Picardy, with their English links, may be responsible for the present look of those centres. About the rest of each roundel, I won’t comment here. While I was looking at Voynich f71r recently (one of the pages with an apparent Zodiac image in the middle), I noticed again how many of the star-holders around the central image have labels starting with ^agaš^ (also possibly equivalent to ^agas^, ^eges^, or ^egeš^ thanks to letters correlating with more than one sound apiece in other systems). Just the repetition alone implies that this would be the word for whatever general idea or category they are all examples/members of, and the hypothesis that the whole page represents a month with individually labeled days would imply that this word means “day” (or something associated with it, like “dawn” or “night”). Also, notice the one just to the left from the top of the outer ring, ^akstwr^. It’s a lone use of ^ak…^ surrounded by a bunch of ^ag…^, but it’s also the only one followed immediately by ^s^ instead of by an apparent vowel. That’s what we would get if it started off as ^eges^ but the second vowel was dropped, thus bringing the ^g^ and ^s^ together, which caused the loss of voicing from ^g^ because ^s^ is unvoiced (ags→aks). This not only fits with the explanation of these figures as days of a month, and the phonetics I’ve been using, and the idea that Voynichese was closely related to Old Romany… but also is the first example of a gallows letter appearing to gain/lose that second loop in the upper left corner in an environment where gain/loss of voicing in speech is predictable… which makes it, depending on how you look at it, either the first corroboration of its kind that that second loop on gallows letters really did indicate voicing while its absence really did indicate non-voicing, or the first corroboration of its kind that ^s^ really was unvoiced, or both. Let me first say that I do admire this effort and think it may have some value. I especially like the large number of images studied. Now on the other hand, as a relative newcomer to the field, I must say that the interpretation of these images as a zodiac appears to be an a priori assumption. It seems like this was taken for granted long ago, but nobody can deny that Diane is right when she says there are some serious issues. I’d be genuinely interested to see an explanation for the duplicate animals for example. If this is a zodiac as we know it? Isnt that incredibly strange? And the unusual physical properties of these animals? And the observation of this expert that some images appear copied from a calendar, shouldn’t that get more attention as well? These are genuine questions since I’m no expert on zodiacs and the history of their imagery. I admire this study and think that any kind of structured analysis of a large amount of data could, however indirectly, help us to gain some insights. But on the other hand it seems clear to me that most of Diane’s objections about the interpretation of the imagery are reasonable. Use the presence of these duplicate animals as your only variables and your number of hits will be small, while this is a major defining feature of the Voynich series. It’s unfortunate that this doesn’t lead to an unbiased discussion about the content. And most importantly, I think that if you were to include some of the features mentioned by Diane, the match percentages with the European corpus would drop considerably. The introduction mentions that the selection of features was ad hoc, so it doesn’t seem unreasonable that some of the most telling features were missed. If you keep operating from the assumption that this is mostly a European zodiac, comparisons to pictoral cycles in this tradition would soon become problematic. I have no doubt about the honest intentions of the researchers, and this kind of analysis is one I’m rather fond of since it quantifies things that are hard to quantify. But I don’t think it’s unlikely that the selected elements have been inevitably influenced by the author’s knowledge and assumptions, which might reflect on the results as well. I didn’t see the a priori thing that you did. Maybe I was looking at it differently from you. But your suggestion that it may be a zodiac from non-European origins may be a good hint which has led me to speculate. Has anyone looked into seeing if Ladino is a possible language of the VMS? The Jews in (south?) western Europe spoke a language that was a mix of Spanish and Hebrew. I am under the impression that there are people who still speak it today. It is called Ladino (at least that is what they say it is called on the interwebs). It wouldn’t be unreasonable to think that they may have recorded their astrological chart in their local language. But, if their language was not normally written, they may have worked with a different method of recording it. That’s crafty. OK, that is speculation on my part. Anyway, it wouldn’t be a surprise if a book was written just before the Inquisition that had astrological symbols that were common in Jewish writings. The surprise is why it wasn’t written in a normal script. Or why no one has found a local conjugate. Maybe they have, but it looks too different, so no one has noticed. Or they are afraid to look at naked women on slides. No kidding. Preists can be a serious bunch. Oh, I’m attaching an image. The web address I got it from is written above the image. And the letter pair I circled is seen all over the VMS (although the connection between the two letters is in a different place on the “o”), Can someone tell me what that letter pair is? That is very interesting! I’ll tell you why. Now the script, that’s another story. I think it must have been constructed around the time these old sources were copied or translated, to form the work that we now know as the Voynich manuscript. There are too many resemblances to European writing customs at the time to defend any other option, in my opinion. So in this, I can follow you, and I do indeed think that the page you show might hold some clues. Because, even more interestingly, Diane has often mentioned that she believes it were Jewish merchant groups who kept the source material, and eventually brought them into southern Europe through Spain. You see, Jews or related groups were often active on these trade routes (She’ll probably correct me on some of those points). So your mentioning of Spanish Jews and this manuscript page is intriguing. I’ll definitely have a better look at it when I have some more time. the theory that this cycle of images represents the Zodiac is a theory, and as such it is falsifiable. Of course it does presents problems and further research would be needed and welcome. This widely accepted theory also has a huge explanatory power: it explains the images as a cycle, providing parallels for the main subjects and the order of the medallions. Since the subjects are rather peculiar (two fish, quadrupeds, a couple of people, two crustaceans, a feline, a woman, a pair of scales, a lizard, an armed man) explaining this sequence is not trivial. Explaining the main subjects obviously is the main task of a theory. Incidentally (and I was not aware of this when I first saw the Voynich ms) this theory also explains a number of details: the fish are joined by a cord that includes a star, the two persons look like lovers, the woman holds a star-shaped flower, the lizard has a star linked to its mouth, the man holds a crossbow. The details are the focus of the present page, but they are not as important as the nature and order of the main subjects. This theory also allowed for the identification of possible parallels for the overall organization of the pages: cycles of images in which 30 radial elements surround the medallions (Alfonso’s Astromagia Reg.Lat.1283 and Lapidario). Everybody here is ready to abandon this theory in favor of a better explanation of the image cycle. Where is this new theory? Where is the supporting positive evidence? As I guess many people here will know, I’m very anti-theory based approaches to provenancing problematic artefacts, and I see it that most basic issue was forgotten from the time that Wilfrid Voynich short-circuited the process by announcing his theory about the whole lot: place, time, authorship and content. Since then, it has been incredibly difficult for anyone to try and start from the basics: like, determining provenance of manufacture and, as a separate matter, provenance for the content. My approach to this manuscript is exactly the same as to any artefact. Forget theory-making, study the primary source – the object, and determine where and when closely similar artefacts, imagery and materials occur. To me it seems very obvious that a zodiac a such has twelve figures, and they represent the same 12 constellations of the Roman series, one for each month, and in whatever stylistic forms are employed in a given place and time. OK – so then whatever the series was designed to do, someone came along and added the names of ten months of the year, using an orthography attested in northern France (thanks, Don) and the names of the ten months co-incide with the Mediterranean sailing year, which officially ended with Sagittarius’ raising his bow, but as we know from the historical records, people did sail later, only not in January or February at all. So the ten months in that Occitan or Jewish dialect are those of the sailing season. But those inscriptions are added, and not believed original to the matter as finalised in ?c.1427, say. Which means the original series of itself could relate to something very different indeed. The outer tiers do suggest some link to ideas about the stars – for which there were many sets of parallel associations and connections. That’s when the research starts, of course. Stylistically, and for other reasons, I suggest the origin of those roundels is Hellenistic, but obviously influenced by later custom among whoever maintained and transmitted the imagery. I don’t find the fact that there are two Aries and two Taurus’ pages as particularly mysterious – the copyist was probably just being pragmatic in the layout of the illustrations. If you look at the original images you will see that the initial Pisces is drawn on an oversized page (one-and-a-half times normal width, f70v2) – so the copyist is able to fit in all 30 surrounding figures. The next two pages (f70v1 & f71r) are regular-sized and the copyist has chosen to draw two Aries, each with 15 surrounding figures. This seems to be purely pragmatic decision – so the copyist can fit it all in the figures. It has to be remembered that the VM is physically quite small, so by splitting Aries/Taurus, probably made the job of copying easier. The subsequent page (f70v1) is again regular sized and the copyist has chosen to draw the first of the two Aries with 15 figures. Again, to fit it all in the figures. The next page is three-and-a-half-times the width, so the copyist has added another Aries with 15 figures, but the space afforded now means they can draw Gemini and Cancer each with 30 figures. The copyist then decided, probably realizing that sub-dividing the zodiac signs resulted in more effort and work, squeezed the remaining signs onto individual pages. You can also notice that the first Zodiac signs are quite decorative, but after a few pages they become much less so. Again, the copyist is probably just saving effort. Perhaps we can speculate that the copyist is copying this manuscript for themselves (and happy to take time-saving short cuts), rather than a commissioned piece of work for a client where standards have to be maintained throughout. The difficulty is there is also so much subjectivity in quantitative analysis, because the subjective observer chooses certain elements as those to be processed. Efforts to ‘number-crunch’ imagery have always stumbled over this, and so you get results where any madonna holding the child on the left hand side can be supposed to belong in a given class, where very telling minor details (such as whether the madonna wears shoes), being overlooked by the person running the ‘program’ results in false provenancing, or inclusion of figures in a supposed ‘lineage class’ which the historical and archaeological and all other evidence show are only ‘like’ on the most superficial level. I once ran two Polish images through all the stock quantitative analyses, and every one identified the ‘King’ of Poland as a religious image of Christ’s mother! As a study the Latin tradition of zodiac imagery, this is a fine survey and must have taken the group a considerable amount of effort and time – for which they are all to be congratulated. It is a model of that ‘forensic’ statistical approach championed by Prof. Charles Rufus Morey of Princeton from before WWII – though an approach with which Irwin Panofsky, just btw – was not entirely in sympathy since it placed over-reliance on similar form and too little on comparable informing thought, philosophy or intended meaning. That method has, however, proved immensely helpful for cataloguing and cross-referencing imagery and for retrieving examples to suit a particular researcher’s needs – that is, within the limits a researcher chooses to define for the purpose of a specific study. Its limitations, then, are not the system’s per se, but any flaws in the researcher’s own premises, and which thus affect their definition of those parameters. In this case, some basic considerations have been omitted with regard to MS Beinecke 408, and which might be worth noting here. First, of course, that it is yet to be proven that the imagery in MS Beinecke 408s calendar was ever meant to be a calendar, or that what we have is plainly not a zodiac in either the Latin or the Islamic tradition – both derived from the Roman. The analogy is made by the imposition on the central emblems of inscriptions which assign each the name of a month; it is hardened by the pre-existing expectations of modern viewers, many of whom have never known any other use for such figures, and so presume “the zodiac” must be the subject of any series evidently related to the stars and containing a number of figures like those used for zodiacs. 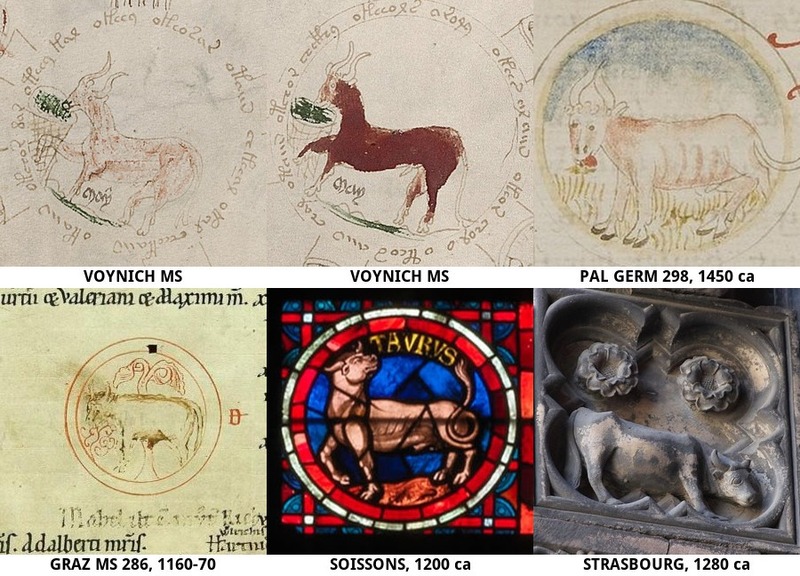 In other words, before comparing the central emblems with ones from any specific manuscript tradition, or pair of traditions, one has to first establish that the series relates to the zodiac, and that it is relevant to the manuscript traditions chosen for comparative study. A second point – one which I consider worth emphasising – is that the researchers would seem to have chosen to omit examples from regions other than northern Europe and specifically Muslim-Islamic sources. I would have liked to see more notice taken of the Sephardic and North African traditions, for example, especially in view of the fact that (a) the leo is not a lion but depicted more like a panther or cheetah and (b) that even within the limits set by the researcher (i.e. 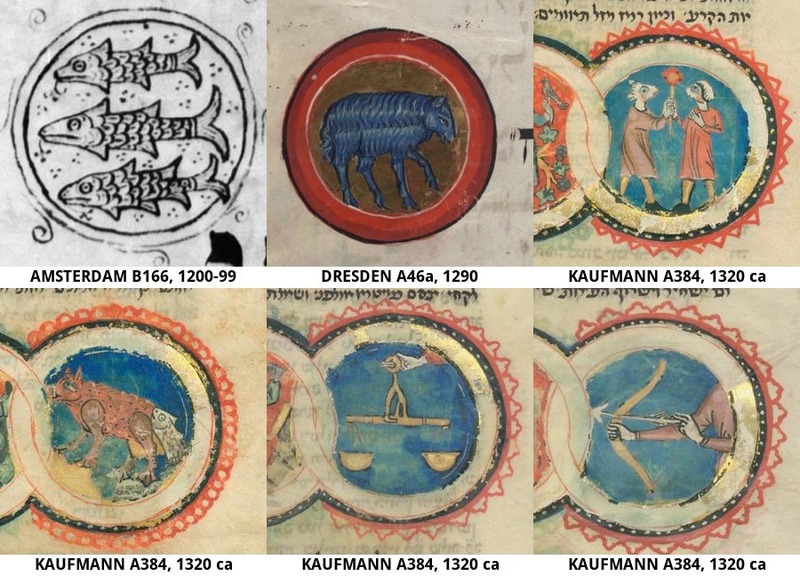 only medieval mss images of zodiacs) that the curled tail is characteristic of Jewish manuscripts per se, and not merely of Ashkenazic ones. A third point is that analogies are made without notice taken of clear distinctions between the cited zodiac figures and the ‘month emblems’ in ms Beinecke 408 – notably the fact that the form given the scales is utterly unlike any form of scales with which they compare it, or which I’ve ever found in any Latin European source, nor any Muslim Islamic manuscript to date. What the authors have done is a make a very thorough survey of zodiac imagery within their chosen period and geographic range. While their survey is intended to convey – more by implication than historical argument – that the emblems’ imagery in MS Beinecke 408 is descended from the northern Latin zodiac tradition, and that all anomalies are attributable to influence on the northern tradition from Islamic works, it has failed to prove this tacit argument, and less by what comparisons have been offered, than the corpus of imagery which it has chosen to omit: the Byzantine, southern (Sephardi), Coptic, and Egyptian among them. The result has been a couple of notable errors in the comparative tables. For example, the ‘Scales’ in MS Beinecke 408 shows very clearly that the trays (more as baskets) are not tied from the crossbar, nor suspended from hooks that are part of the crossbar, but are suspended from a separate, and thinner rod apparently passing through the crossbar or inserted by piercing into the ends. Where did that style of scales come from? What does it tell us about the provenance of these centres? I spent some time on that question, because what *doesn’t* fit is more telling that what conforms to stock habits, or what can be implied to conform to them. Such a scales was used, and is still used, by persons selling in markets in north Africa. Its value lies in being demountable, and thus more portable, and by its using less of the more expensive materials forming the rest and illustrated in the medieval Latin mss. The seller can thread any handy piece of wood or metal through the short, hollow body when they get to market. However, that type descends from an older (pre-Islamic) Egyptian and Libyan type and I have found neither pictorial nor documentary evidence attesting to its presence in northern or central Europe – let alone its inclusion in any Latin manuscript from those regions, whether in or out of a zodiac. The same goes for other anomalies, such as the form for the lion. As to the curious form for the ‘scorpion’ I think Ellie Velinska is on the right track here, though her only example so far is late (the terminal end of the research string, as it were) and in a printed text, where it is called the ‘Apothecary’s skink’. I think the survey which the authors have done is sufficient to merit an academic paper, but if they are thinking of its publication, I should recommend their removing reference to the Voynich manuscript; it forms by far the weakest element among their cited comparisons, and leads to erroneous ‘parallels’ whose flaws will be as immediately obvious to non-Voynich specialists as I’ve noted here. It is, in every other respect, a model of the ‘Morey method’. Best wishes to the authors. The authors neither state nor assume anywhere that the cycle represents a calendar. The fact that there are month names written near each of the illustrations plays no role whatsoever in the analysis. This is indeed the correct approach, since we cannot tell if they are contemporary to the MS or from a later date. 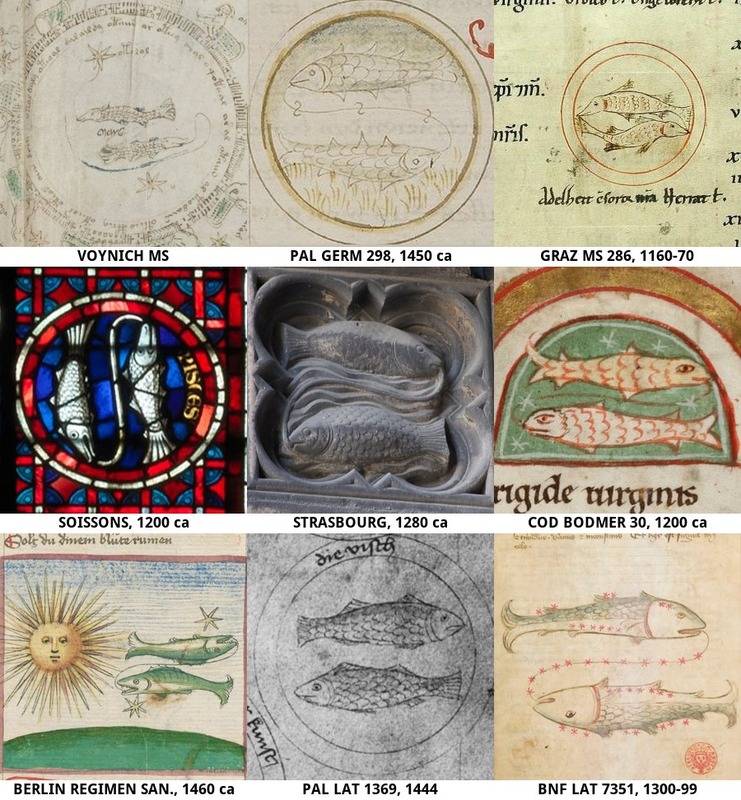 In the description of Pisces, the authors clearly demonstrate that their example manuscripts include both astrological texts and calendars. This is a statement without any basis. It is either a presumption of Diane, or based on some restrictive definition of ‘zodiac’, which, by the way, the authors are not making. An unbiased reading of the article clearly shows that the authors are treating the illustrations as a series of zodiac emblems (which nobody seriously contests is what they are), and without making any presumptions about the purpose or the origin. They are compared with other series of zodiac emblems. Incidentally, Erwin Panofsky, who is often cited by Diane as a reference, considered it a zodiac. The objection of bias towards northern European MSs is impossible to understand. The article opens with two large illustrations and ample discussion of precisely the regions that are supposedly missing. No need to go into all the comments. The argument about the scales was already rejected before as the form Diane supposes for the scales cannot be justified from the drawing. It could be added as another point in the comparisons, in principle, but in this case it would be a prejudiced one. If the Zodiac art of other regions has been neglected, it should be possible to assemble an equivalent article illustrating them instead. I would want to see that. It is not a presumption, as you suggest. It is an absolutely objective statement. A zodiac contains 12 stock figures. This does not. A zodiac does not include two goats and two bulls – this one does. What has happened is that people who wish to argue a preferred position, usually Euro-centric (which may prove, one day, to be true) have looked for the only familiar series they happen to know – aided of course by the later inscriptions – but instead of concluding it represented a calendar. It does, after all include month-names – they concluded it was *meant* to be a zodiac. Perhaps. But the fact is just that – a fact. The series does not represent a zodiac. Saying it was “meant to” or “should be” is not a reasonable conclusion from the evidence. If anything, the only possible conclusion is that whatever its original purpose might have been, the persons who added those inscriptions used it as a calendar. Since this is a last-point in the series’ historical development as far as we know, that is its last use, and only reasonable description. Rene, do please try to keep your comments about the manuscript. I have had to endure almost eight years of your constantly sliding away from objections to set habits in Voynich studies, by your implying that I am in some way mentally, morally, intellectually or otherwise less than sensible. I really have become tired of it. If you have any solid, intelligent or reasonable argument for this series actually being a zodiac, or can produce one containing the same number of figures, with two goats and two bulls, and plainly not meant for a calendar but a zodiac, then please produce your evidence. Your oblique, snide ad hominems are becoming as irritating to others as they have finally, after enduring them for years, made me exasperated. Let’s talk facts, and opinions about the manuscript. Your opinions of me are based on as little informed or balanced information as many of the ideas you express about art – which, actually, is my area. You criticized a very interesting and valuable contribution, and I criticized your comments, not your person. I will leave it at exactly that. Rene, a comment expressing your personal opinion of Ponzi’s work is a comment that – as personal view of it – you are entitled to. I commented on a disparity between the assumptions inherent in the presentation and the evidence of the primary document. Your response was irrelevant and inappropriate – attempting to say that because I made a comment about the manuscript I should be considered in some way “bad person”. This has been a long-standing habit of yours, to side-track discussion of the manuscript by attacking people whose opinions raise reasonable doubt about the validity of those you prefer. After seven years of bearing with you in silence, I am now saying that I will not tolerate this practice in future. Please confine your attention, and your remarks to MS Beinecke 408 and not to other researchers, especially not by suggesting that anyone who holds different opinions or produced contrary arguments is mentally, morally, intellectually or socially your inferior. Let’s hope that will be the last occasion I have to publicly criticise the habit. I must say that I have seen no evidence of the kind of behaviour you mention. All the comments from Rene that I have seen on this site and elsewhere have been on professional matters, and are backed up with evidence. I do not see any conspiracy. That said, could we please treat the matter as closed, as it doesn’t take us forward in any way? I am not speaking of a conspiracy, Stephen. I am speaking of snide comments suggesting that I am either a bad person, or an irrational one. Being yourself an academic you may better understand than Mr. Zandbergen that such attacks are to be regarded more seriously by scholars than by the general public. I should be most grateful if you would ensure that your site is not used to continue this form of harrassment of which, after so many years, I have had quite enough. I do not think you should allow another insinuation to be published through your site suggesting that my objection is due to anything other than the impropriety of his behaviour. I have also taken a copy of his remarks and your use of the term ‘conspiracy’ -hope you don’t mind. I do so on advice. It would be a good idea to post links to the particular blog entries where you made the points you’re referring to here… or just rewrite or copy & paste them here. I, and presumably others here, haven’t seen them, don’t know where this blog is, and would find it an obstacle to then try to find the right specific articles even if I/we knew the main blog page. I have looked for signs of RZ saying anything personal about you at all, including [i]ad hominem[/i] arguments. I have seen none. I believe your perception is skewed, contorting opposition into denigration/harassment. It’s something human minds do easily & often. Let me reply to Rene Zandbergen’s personal views which he here asserts as if they were a recitation of objective fact. “wholly unjustifiable” – this is a personal idea, which simply shows a lack of informed research. That the conclusion was not unjustified is shown by the range of comparative examples, and the depth of research underpinning them which was published on my blog. Evidence is justification for a conclusion. Mr. Zandbergen is evidently unaware of the connection between the 12 months of the calendar, the inscription of month-names, and the series of zodiac imagery. 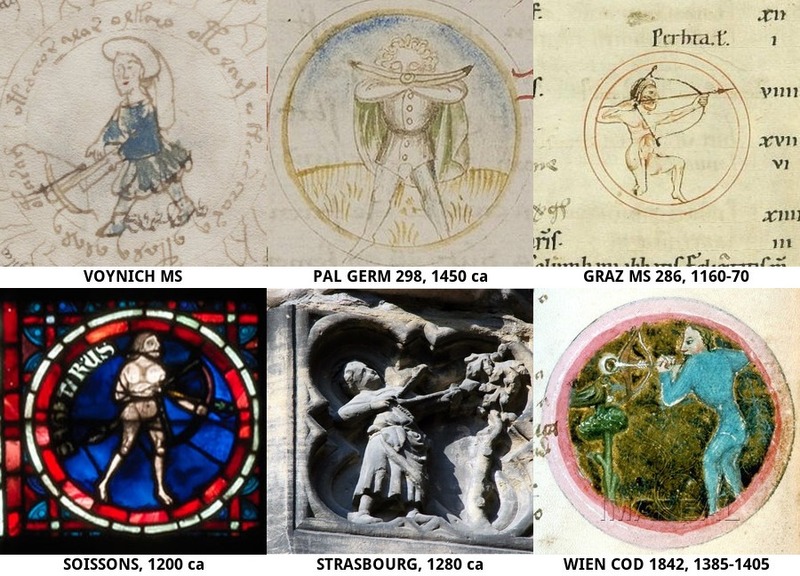 In medieval Europe, and indeed in most of the examples which he himself has cited (the same ones, over many years) the examples have come from calendars illustrated by zodiac imagery. Mr. Zandbergen has quite missed the point: which is that not only does the series in MS Beinecke 408 not represent a zodiac, but that even by association (i.e. by reference to the month names) that cannot be presumed the original intention for that series. This statement that the series of images now forming – in effect – a calendar in MS Beincke 408 does not conform to the zodiacs of the Christian or Islamic tradition has its basis in research whose origins lie not in my writings about this manuscript but in 40 years’ research and experience in iconographic analysis. If Mr. Zandbergen wishes to produce an example of a zodiac of this form from the Islamic or Christian manuscript traditions, then the usual method of objection would be to cite contrary evidence. Only those unable to address opinions with evidence need to resort to assertions and insinuations about the character of the person for whose opinions and conclusions they have no objective basis for contradiction. An unbiased reading of the article clearly shows that the authors are treating the illustrations as a series of zodiac emblems (which nobody seriously contests is what they are)..
Well, yes, I do contest that they are, and as it happens, I am not only “a person” but one with some years’ experience – even if we limit it to research into this one manuscript. Incidentally, Erwin Panofsky, who is often cited by Diane as a reference, considered it a zodiac. Irwin Panofsky referred to the section in the way that everyone did during the 1930s. He also said it was southern, Jewish and evinced evidence of Kabbalah. I should like to see that last explained by someone better acquainted with the Jewish Kabbalistic tradition than I am. No need to go into all the comments. – Yes, that is really what one does have to deal with, and refusing to do so – in favour of ad.hominems, does not improve the nature of the dialogue, address reasonable question, or advance our understanding of this manuscript. The argument about the scales was already rejected before as the form Diane supposes for the scales cannot be justified from the drawing. – I fail to understand what is meant here. To my knowledge no-one except me has investigated the form of these scales – using historical, archaeological, iconographic and other primary sources. To say that such a detailed investigation and its conclusions are “rejected” means, in effect, that the speaker expects everyone to abandon their critical faculties and simply ‘believe’. 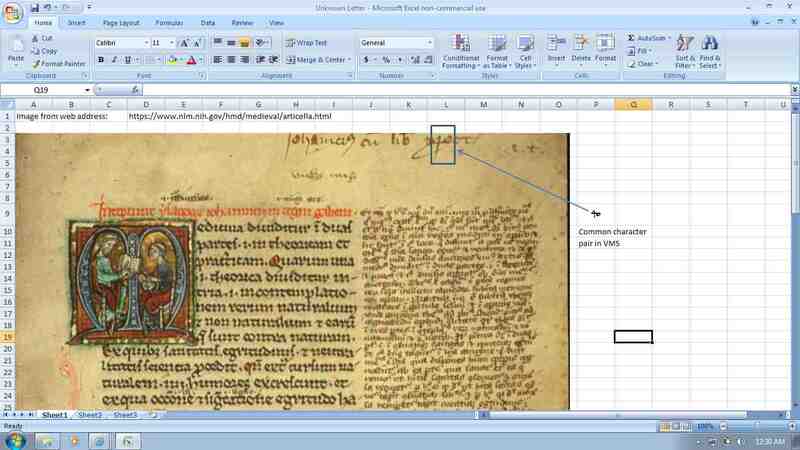 I do not see how this assists a proper understanding of the manuscript. The fact remains that no medieval scales are constructed as those shown are. It follows, then, that a medieval example must be found, or my evidence and conclusions accepted in the meantime. It could be added as another point in the comparisons, in principle, but in this case it would be a prejudiced one. Again, this nice-sounding sentence appears to carry little import. I can understand why Mr. Zandbergen might refrain from offering any plainly prejudiced opinion. Diane, as far as I can see, the points Rene made were entirely about the content of the argument. I saw nothing personal or rude or unkind in it – just a disagreement about ideas. I can see nothing anywhere which suggests you are ‘a bad person’ or ‘irrational’. He simply has a different view from yours about the Voynich manuscript. If the discussion can be continued in a normal manner, I would be only too happy to show that those who believe that the illlustrations represent a zodiac cycle are in truly excellent company. Prof. Bradley Schaefer ( http://www.phys.lsu.edu/newwebsite/people/schaefer.html ), who has published on the work of Hipparcus and Ptolemy, wrote an article in Sky & Telescope 100, 5 (November, 2000), describing the images as a zodiac. Prof. Robert S. Brumbaugh of Yale, known best to Voynich MS enthousiasts as the proposer of an incorrect solution to the text, was a respected scholar on Greek and medieval philosophy, and clearly called the illustrations a zodiac. In 2004 I had the opportunity to present the Voynich MS zodiac illustrations at a symposium of historians of astronomy in Prague. I had no objection from any of the scholars present that this was not a zodiac, and the paper was finally peer reviewed and published by Charles University as: “Zandbergen, R. and R. Prinke: The Voynich MS in Prague, from Rudolf II to Johannes Marcus Marci. In: Acta Universitatis Carolinae, Mathematica et Physica, Vol. 46, Supplementum, 2005, pp. 141-152”. It concentrated on the zodiac illustrations. D’Imperio, whose monograph is a summary of a lot of correspondence preserved in the Beinecke, including the likes of Charles Singer and indeed Erwin Panofsky, calls it a zodiac without any hesitation. The arguments presented why it should not be a zodiac are countered so easily that I had not even thought it would be necessary. It is indeed incomplete, but so are several of the zodiac cycles in the example manuscripts used by Darren and Marco. Specifically, at the location in the Voynich MS where the two missing signs should have been, a folio was quite clearly cut out. Aries and Taurus are duplicated indeed. However, it is completely obvious that each only represent half the zodiac sign, by counting the number of human figures with stars. While the animals in the Aries illustation are often compared to goats, it is far from clear that they are. Goats have tails that go up and most goats have beards. The zodiac images lack both features. Marco, although I do not study the imagery, I want to congratulate you on your post. It is a really great rundown of the research done to date while also pushing the boundaries forward. One part of the Voynich Zodiac imagery which makes me curious is the shape & orientation of the bull’s horns. Bulls’ horns normally are oriented mostly out to the sides and not much up & back, and they also usually have a simple single curve rather than an S-like, serpentine, back-&-forth shape or much of a three-dimensional twist. The combination of a mostly up-&-back orientation and a shape that either waves back & forth or is twisted seems pretty rare. The ones in the Voynich Manuscript first made me think of a particular image of the Egyptian god Apis/Hapis, in which the sun was held between the horns where they curve back closest to each other, but even Apis/Hapis with the sun on or over his head doesn’t normally have horns like that. (I just did an image search to try to illustrate what I was thinking of, and I can’t find an example online that looks like the image I had stuck in my head from years ago. So even that one probably was memorable to me mostly because of the unnatural weirdness of its horns.) If I didn’t know that the context was an astrological text from Eurasia, those horns, combined with how lean the body is for a bull, would have made me think the Voynich Taurus was meant to depict not a bull but a kudu. But Taurus is like that twice in the Voynich Manuscript, and in “PAL GERM 298” (where the horns even seem to touch). Were there any other examples with horns like that? The bit about Virgo and “corn” presumably must not mean what a lot of native English-speakers think of when we see & hear the word “corn”. We use it now for one particular kind of plant, also known as “maize” (a word which we are aware of but rarely use because we call it “corn”). It’s native to North America and couldn’t have been known to Eurasians for most of the time that Virgo has been Virgo. Maybe other English-speaking countries still use an older use for that word which included all kinds of grain plants (maize, wheat, barley, oats, rye), roughly synonymous with how we now use the word “grain” or “cereals”. Every Virgo depiction I’ve seen with grain looks more like wheat/barley/oats/rye, not maize, and every verbal identification I’ve seen for it said “wheat”, which makes sense because most of them predate the existence of maize in Eurasia. For the Arabic word which is translated above as “ear of corn”, all I get at Google Translate is “ear” with no species named. So I figure everybody was talking about wheat all along here, but using a word for it that sounds to a lot of us like it isn’t talking about wheat. (See also the horns of the Soissons Aries above). Will you maintain a top 10? Inevitably, new MSs will be found. Hello Rene, thank you for your kind words! I agree on the opportunity of maintaining a top 10, I really hope that new parallels will be found! I would be interested in other people independently computing matching percentages: however “quantitative” one tries to be, there always is a certain amount of subjectivity in visual analysis. Maybe I should add that I know that this research is far from being exhaustive: there must be thousands of ancient zodiac cycles around the world. It was not my intention to examine them all. For the specific case of Vat.Lat.14935, it seems to me to match 8 binary characters (4 of which from Virgo): 40%. In general, I think the most telling zodiac signs are: grazing Aries, Gemini as lovers, lizard-like Scorpio, human Sagittarius. In my opinion, the presence of at least two of these hints to the possibility of a close cognate of the Voynich zodiac.